"On a hot day in Texas, nothing is more refreshing than this sweet, fruity, non-alcoholic summer iced tea." In a large pitcher, combine sugar, salt and hot water. Stir until completely dissolved. Sir in the tea, orange juice and lemon juice. 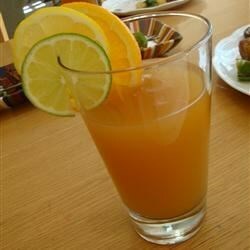 Serve in tall glasses with ice and slices of citrus fruit. Tastes like punch. It's o.k., but I wouldn't make it again. I love this recipe. I would add just a bit more sugar. Mmm. Pretty good. Reminds me (only a little) of Arizona Iced Tea. I'm enjoying this tea! It's a little on the sweet side, so I would cut the sugar back next time. Great for the hot Texas summer! Excellent. It was fun to make it and tasted very good. Thanks for a great recipe. A very good iced tea!